Click image to view film at this site [requires Quicktime]. “Tuscaloosa, The Nineteenth Century City,” is a short film by ten students enrolled in HY 300 – The Nineteenth Century City at the University of Alabama. 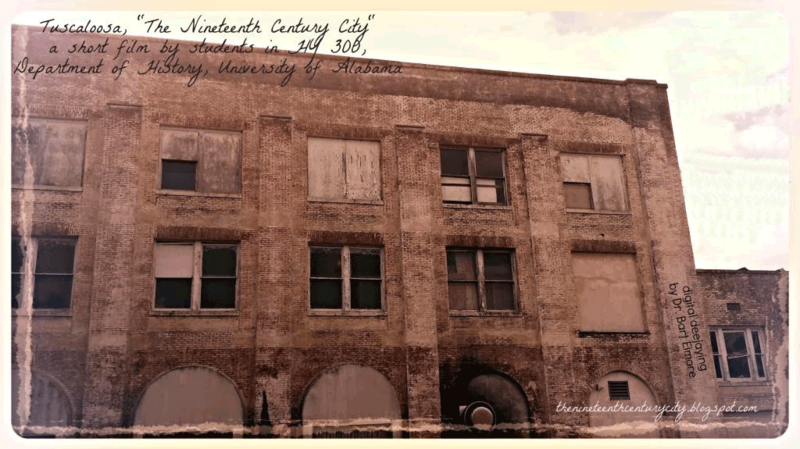 Their instructor, Assistant History Professor Sharony Green, challenged them to find “the nineteenth century city” in Tuscaloosa. Each student conducted research and became an “expert” on a local building. This film is the culmination of their efforts. Former Assistant Professor Bart Elmore, who spins vinyl as a hobby, did the soundtrack for this project. Click here for the Crimson White’s coverage of the event.